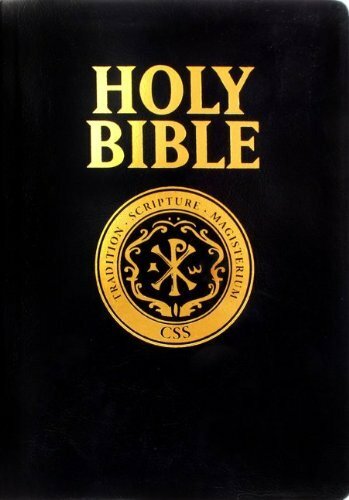 Back in March of 2011, I reviewed the Catholic Scripture Study International Bible (RSV-CE) published by Saint Benedict Press. I noted that it wasn't a proper "study Bible" due to the absence of cross-references, more detailed maps, and notes/commentary. However, I found it to be a very good apologetics study Bible, with a very nice overall feel and look to it. As I mentioned during that earlier review: "The real jewel of this study Bible is the apologetics content found in the 76 full color pages. Most notably, the eight pages of “Catholic Apologetics Bible Verses” I have found to be quite helpful. This section not only covers issues ranging from “Anointing of the Sick” to “Works” but does so with both biblical citations as well as direct quotations from the Fathers of the Church." 2) The eight pages of "Catholic Apologetics Bible Verses" mentioned above were a handy and well-organized component of this Bible. Not only did they point out verses that have been used to counter various Catholic teachings, but included ample counter verses as well as full quotes from the Fathers. These "helps" were exceedingly useful when I was preparing for a lesson or when I was responding to a student question but couldn't remember the verse I wanted to cite. All in all, this is a fine Catholic Bible. With that being said, I would love to see a future edition that incorporated some of those elements that I feel were missing. By simply adding cross-references and some more maps, like the "Route of the Exodus" and "Paul's Journeys" for instance, I think the CSSI Bible would become a premier reference Bible for Catholics. Doesn't this edition have the words of Christ in red lettering? I ask because this is a major deterrent for more than a few people and knowing this would be helpful to them. Indeed they are in red. The listing on the SBP site does mention this. I know most people are very either for or against having a red letter Bible. Its not too big a deal to me. However it is important that SBP knows what their customers prefer. Maybe the topic of red lettering can be a question for one of your semi-regular weekly polls. What makes this edition 'international'? Simply that it is produced in conjunction with the organization Catholic Scripture Study International. I agree, this is a good apologetics Bible. The font size and print layout make this Bible a joy to read. I have had Bible inserts in the past which I put in the Bible cover for apologetics reference, but they get beat up and start tearing at the folds, so it is nice to have the info inserted in the Bible. If this Bible had the RSV-2CE translation in it, it would even be better. Overall this Bible is a good size and feels like it is well made.